(15/P53) TRENTON – Crossing a busy road in Bedminster is about to get much easier for turtles and small mammals, now that a new underground wildlife passageway is open in the township, the Department of Environmental Protection’s Division of Fish and Wildlife announced today. 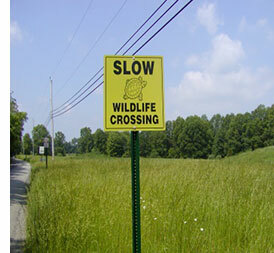 For years, numerous turtles, frogs, snakes and small mammals have been killed along a section of Bedminster’s River Road in Somerset County, a main corridor that runs parallel to the nearby Raritan River and links Central New Jersey’s busy Route 202 and Interstate 78. 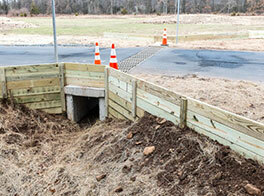 Consequently, the DEP has taken steps to protect the wildlife in this area by installing a first-of-its-kind tunnel system to help these animals cross River Road safely. Bedminster’s wildlife tunnel and the fencing surrounding it came about from a statewide project known as Connecting Habitat Across New Jersey (CHANJ), which helps conservationists and planners identify important movement corridors for wildlife and how to help animals move about more freely. The DEP approved permits for the project in 2012 as part of a larger plan to enhance recreation opportunities on township land in Bedminster. The DEP, township and project partner New Jersey Audubon Society worked together to develop and complete the $90,000 project, which was paid for by the township. Stretching 2,000 feet on each side of River Road, angled, wooden fencing steers wildlife into one of five tunnels, designed specifically for animal crossings. The concrete tunnel entrances, which measure roughly 2 feet high by 2 feet wide, span underground across the width of the two-lane road. A mulch substance lines the bottom of each tunnel to mimic a natural surface, and a grated top allows light and moisture to seep into the tunnel’s interior – important features for the turtles and frogs that will move through them. Animals move around for many reasons, particularly feeding, breeding or migrating. As a result, they need to be able to move safely through the landscape to find food, mates and protection. Without that ability, certain animal populations can become disconnected, isolated, and over time, dwindle, be listed as endangered or threatened, or ultimately disappear. Bedminster Mayor Steve Parker is pleased the crossing is open for wildlife use. The River Road project is the first in the state to incorporate all of the modern design features of emerging “road science,” according to the Endangered and Nongame Species Program. Using GIS mapping and on-the-ground surveys of wildlife mortality, staff have identified several other priority road-crossing areas that would benefit from tunnels and fencing. Several scientific studies have shown that well-designed and well-placed wildlife passageways are extremely effective at reducing the number of animals killed on roadways. Montclair State University faculty and students have begun a study at the River Road site to determine the tunnels’ effectiveness in reducing wildlife-vehicle collisions and maintaining or restoring movement corridors for wildlife.